Download our Free Tie Craft Template and cut 8 ties out on a variety of papers, poke holes in the top corners and thread onto a length of twine. Cut out 7 scalloped circles and using foam squares stick on the ties, skip the 5th tie so this is blank. Cut out and add the letters. 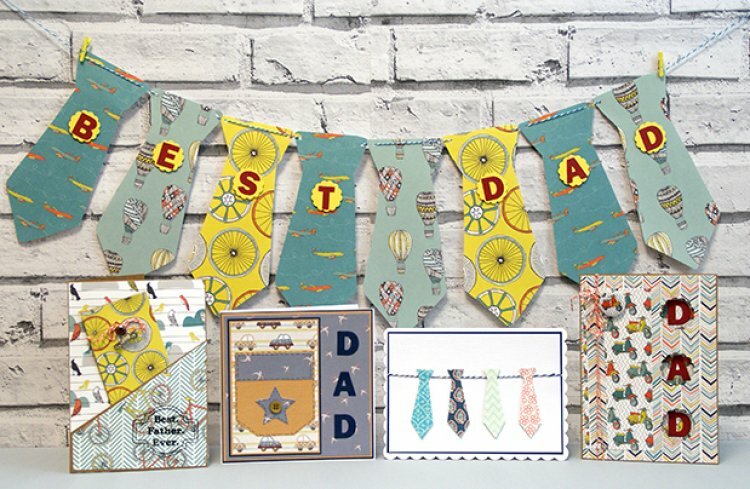 This father’s day card is easy to make and the removable tag can be used to personalise a loving message to Dad! Take a 5 x 7 card blank and cover the front with the bird print card from FE Man Made. Cut a piece of Kraft card to 12.5 x 12 cm, measure 3cm up on the left then cut diagonally to the top right corner, cover with the bike print card and glue around the sides and bottom so you create a pocket when glued down. Cut a piece of Kraft card 6.5 x 14.5 cm, cover with the wheel print card and embellish with a brad, car charm and twine from the Man Made embellishment kit. We love the layered effect on this charming father’s day card. To make take a 5x 7 kraft card and cover the inside with scooter print Man Made paper, cover the outside with the cool chevron print. Using a 3cm scalloped circle die or punch, cut out three holes down the right hand side. Cut more scooter print card to 6.5 x 15.5cm and stick on the left hand side of the card. Cut a strip of chevron card 2 x 15 cm, cut the bottom end to flag points and glue on top of the scooter print. Cut out the letters DAD and stick in the cut out windows. Finish by wrapping with a length of twine around the front of the card and tying with a bow, then add a Man Made scooter brad. A simple but effective card for if your pushed on time. Layer 16.5 x 11.5cm white card on top of 17 x 12 cm navy card, wrap a length of twine around the two and glue down on a 5x 7 scalloped card blank. Cut out 4 ties roughly 7cm in length, stick down using foam squares. Add a sentiment to make it extra special. Cut a piece of blue swallow card 14 x 14 cm and layer on a piece of mustard card leaving a 2mm border, repeat on some navy card, glue on a 6x6 card blank. Cut a piece of car print paper 8 x 12.5cm again layer on a piece of mustard card leaving a 2mm border, repeat on some navy card, stick to the card blank. Cut a piece of mustard card 7.5 x 8cm, trim the bottom corners to create a pocket then add a strip of card and a star in the swallow print paper, add the extra detail with a button and faux stitching. Finish your card with the cut out DAD letters. Show us what you have made for your dad in the Project gallery, there is plenty more inspiration to inspire you there.